Billions of tweets. Each week. How can your tweets get noticed in the endless stream of twitter and chatter? How do you enchant your followers? And get retweeted? Use Buffer to schedule your tweets, but also turn up in real time to reply, to retweet, and to engage. Real time conversations are more fun than delayed replies. Avoid automatic cross-posting from other social networks because it’s like phoning someone each time you email them to check they’ve received your email one minute ago. Occasional cross-posting is fine, but make sure you don’t just take up space. Tweet your own posts a maximum of three times, and write a different tweet each time you tweet it. When you endlessly repeat the same tweets to promote your own posts, people start thinking you have nothing useful to add. Stop using Paperli. Just tweet links to interesting articles. Why complicate matters with an extra click? Use one or two hashtags, or none. Too many hashtags bury your message. Take a break if you feel like it. Sometimes I get tired of all the chatter and just disappear for a day or two. Avoid automatic DMs. You don’t walk through your high street and shove a note like me or circle me under people’s noses, do you? Sometimes the endless stream of tweets feels like one-way traffic. But there are precious opportunities to connect. Twitter isn’t a sales platform, it’s a giant networking event. Engage people by following these 12 tips. Find people whose tweets you enjoy. Use Hootsuite or another tool to create lists so you can keep an eye on their tweets; and keep your lists updated. Show a clear picture of your face. People connect with people, not with cartoons or logos. Have something to say. Nobody is interested in learning that you’re bored out of your mind, or tired, or going to sleep. Dan Zarrella has proven it. Don’t mindlessly click tweet buttons on blog posts all the time because that’s what most people do. To stand out tweet a quote from the post or rewrite the headline to make it even more powerful. Share your opinion. Add a valuable remark to a retweet rather than lazily clicking retweet. Use a thank you as an opportunity to connect, not as a meaningless obligation for each and every retweet. Ask a question or add a comment. As an alternative thank you, consider following someone or retweeting one of their tweets. Use Twitter handles to acknowledge a blogger. Most Twitter sharing plug-ins don’t include the Twitter handle of the blogger automatically. Including a blogger’s Twitter handle is like saying thank you for writing plus it’s an opportunity to engage. You earn extra brownie points for looking up a guest writer’s Twitter handle. Use the power of the period. When you reply to someone, use a period before their Twitter handle if you want more people to see your reply. Try a cc. When you think someone is really really super-interested in a blog post and you want to make sure they see it, use a cc with their Twitter handle at the end of your tweet. Try to keep your tweets to fewer than 120 characters, because it makes it easier to retweet. Use a hat tip.When you like an article someone tweeted, but don’t like their tweet, write your own tweet and acknowledge the original tweeter with a hat tip: add HT plus their Twitter handle at the end of your tweet. Don’t talk about what you’re doing. Talk about what fascinates you. 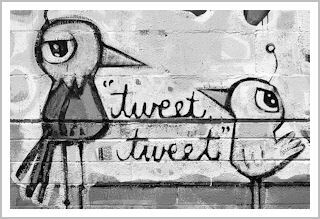 Writing tweets is fantastic practice to improve your writing skills. Be concise. Grab attention with power words. And learn to develop your own voice. Develop your own style. Mix it up, experiment, and find out what works. Start a tweet with New blog post, when you’ve published a new post. Because people are attracted to new stuff (source and source). Use your own favorite phrases, because it adds personality to your tweets. Be enthusiastic about what you’re sharing because it shows. Don’t make tweeting a chore. Ask questions. It shows you’re interested and occasionally it may spark an interesting debate. Try using the word you, because it feels more like a real conversation. And tweets with the word you get retweeted more often. Wink, smile, or try a big grin. Use emoticons, because it makes you more human. Use unusual words because they attract attention and create a sense of novelty (source). Write your tweets as if each word matters, because it does. Plenty of stats exist that tell you how to become more popular on Twitter. Use the most retweeted words. Don’t use the least retweeted words. Use links in a specific percentage of tweets. Put a link in the middle. Etc. But if we all follow the stats, don’t we all start to sound the same? Like with all types of conversation, you need to find out what works for you. Learn how to show your enthusiasm. Consider how to demonstrate your expertise. Decide whether you’re comfortable with personal tweets or not. Twitter will be most successful for your business if you let your personality shine through. Be you. And have fun. Thank you for #4! Somehow I’ve always found content aggregators like Paper.li annoying. I prefer to click on my own links rather than click on a link that takes me to more links. The idea is just confusing and annoying. Something that’s worked well for me is to find a popular hashtag that has an engaged following and use it regularly. I use #amwriting a few times a week and every time I end up gaining a bunch of RTs, favourites and new followers. With twitter, it’s a nurture vs nature thing. Just because you’re tweeting, it doesn’t mean you’ll attract the kind of people you want. When I started on Twitter, I felt honored when someone mentioned “top story via @HennekeD”. I quickly learned that it doesn’t mean anything at all. I now refuse to click through to find out which of the articles I tweeted was included; and I usually don’t follow back when people mainly tweet Paper.li stuff. Good tip on the hashtags. I’m probably a bit too lazy with them and should pay more attention! I am constantly amazed at what I don’t know. I’m not resistant to learning it but nothing is ever simple. Excellent lesson. Thank you. I agree with you – nothing is ever simple; and the more you learn the more you realize how much you don’t know. It’s a joy to learn something new, but it can also take up a lot of time as we learn by doing and making mistakes. Great article, Henneke. I am just beginning to see how Twitter can be useful for my business. I really like the tip of the hat idea. Can you explain why a period before a twitter handle makes more people see the tweet? When you reply to someone’s tweet (often called an @mention), you automatically start a tweet with their handle. This means that only you plus the person whose Twitter handle you use plus the people who follow you BOTH see the tweet in their stream. If you want all your followers to see your tweet instead, you can add a period before the @mention, or alternatively, you can add another word. @words2wow Thanks for your tweet! 🙂 I’m curious – where are you based? [email protected] Thanks for your tweet! 🙂 Nice flower in your Twitter background! Update: I went to Buffer about which I had never heard. I may or may not use it but I did sign up. I discovered an app called “Tweriod” that analyzes your Twitter follower and tells you the times that they are most likely to be on the site. This answers a question that I and my clients always have about the best time to tweet. Tip #1 is a true winner so thanks again. Thanks for sharing your tip on Tweriod. I’ve used once or twice in the past, but haven’t thought about it for a long time. Good tip! Henneke, I’ve recently started reading your blog posts and they are really enchanting. I was trying to subscribe to your feed instead of getting a newsletter but did not find the feed icon anywhere on the site. Is there something I am missing or is it left out by design? If by design, what is the reason behind it? I think it will be interesting to read for all of us. In most RSS readers you can use the URL http://www.enchantingmarketing.com and they’ll find the feed automatically. If that doesn’t work, try this one: http://www.enchantingmarketing.com/feed/. Let me know if it doesn’t work! 29. Be comforting and supportive. There’s too much self-promotion and not enough kindness on Twitter. Plus that’s what all of us really need and are looking for. The best way to build a community: Be human. Be interesting. Be engaging. Fantastic article! We featured it in our Monthly Resource Roundup- http://www.aseohosting.com/blog/2013/11/seo-content-marketing-social-media-best-october-2013/. Thanks for this Henneke! I printed it off and gave it to a client who’s relaunching a new brand in the coming weeks – a great guide: fun, effective and useful! I am doing a Twitter Skillshop tomorrow and will share some of your tips with the class. Everyone is a beginner, so some of it is too advanced but I learned a lot from reading the article and I enjoy the general professionalism and high quality writing on your site. Keep it coming! I realized after reading your post that I’m guilty of #11. In an attempt to begin connecting on social media, I thought that it would be easiest to “curate” and share feedly posts that I thought would be relevant to people I would like to connect with. Though I have been building my follower list, I’ve also been seeing a high percentage of unfollows also and I wasn’t sure why. Don’t get too hung up about people unfollowing – a lot of people follow and then unfollow, so it’s not necessarily a sign that they don’t like what you do. I had a quick look at your tweets – you might want to start using Buffer so you can space your tweets rather than tweet everything at the same time. Buffer’s starter plan is free and more than enough to get started. Another trick to increase interaction is to retweet other people’s tweets (with a comment) – this also increases the chances that they’ll follow you back.